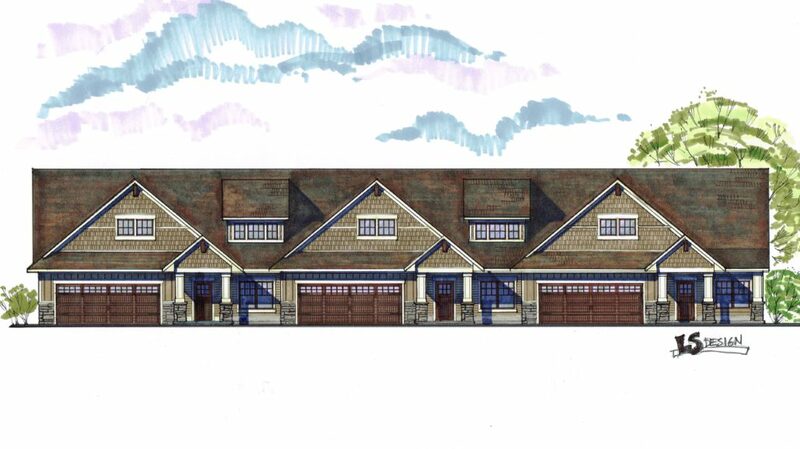 Holland Home is developing a 60-acre residential campus expansion in Kentwood. In an effort to accommodate the aging populations’ desire for independent living near a senior care provider, Holland Home is constructing 47 homes at its Breton Woods campus on Breton near 44th Street. Called Breton Homes North, the independent-living community will offer standalone and condominium-style residential living. When completed, Breton Homes North will offer 47 homes spread out across 60 acres on the hilly, park-like setting of the northern portion of Holland Homes Breton Woods campus. The homes, which will be equipped with the latest in smart-home technology, will range from standalone townhomes to duplex and triplex floorplans, ranging from 2,200 SF to 2,600 SF. A second phase, which is expected to offer 72 standalone homes, will be developed once the initial phase is complete. Starting prices will be offered in the low $300,000 range. Breton Homes North, Holland Home’s first independent living development since 2008, represents its most high-efficient and high-tech product than it has offered before with a lot of standard offerings that used to be considered upgrades. “Holland Home is excited to add additional independent living options at our beautiful Breton Woods campus,” said Mina Breuker, Holland Home President and Chief Executive Officer. “We are eager to show the region just how wonderful of an experience residents of Breton Woods North will have. It will be unmatched in our region,” Breuker adds, referring to the abundance of amenities offered by the development. Homes are currently being built and sales and marketing efforts are underway. “Breton Homes North will offer the quality and sophistication you are accustomed to with Holland Home independent living,” said Michael Loughman, Director of Sales, Holland Home. Each home will include gourmet kitchens, large gathering spaces, three bathrooms, finished basement, covered front porch and rear deck, two stall garage and optional screened or four season porch. Residents at Breton Homes North will also have access to all Breton Woods campus amenities including wellness and fitness centers, indoor pool, restaurants, art studio and wood shop, health center and life enrichment activities. Finished lower level with bathroom, bedroom, and family room. Kitchen: Kemper Choice cabinets, granite or quartz counter-tops; Stainless steel appliances, French door refrigerator, pantry. Individuals interested in learning more about Breton Homes North or scheduling a tour can contact Holland Home at (616) 643-2730 or learn more at www.hollandhome.org.